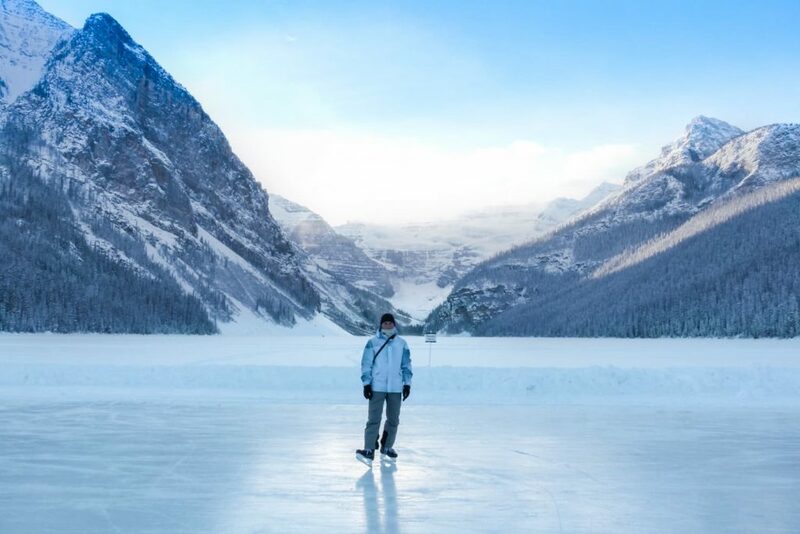 Ice skating in Banff on a frozen lake surrounded by mountains is the most Canadian thing ever. 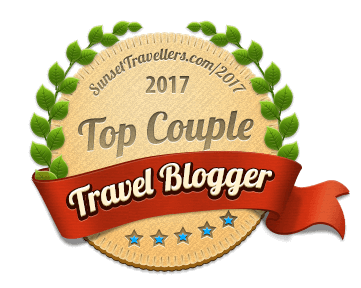 The ultimate winter adventure is a bucket list for everyone visiting the Canadian Rockies. Learn everything you need to know – where to skate, when the best time to head out is and more. Michal and I have a long relationship with ice skating. 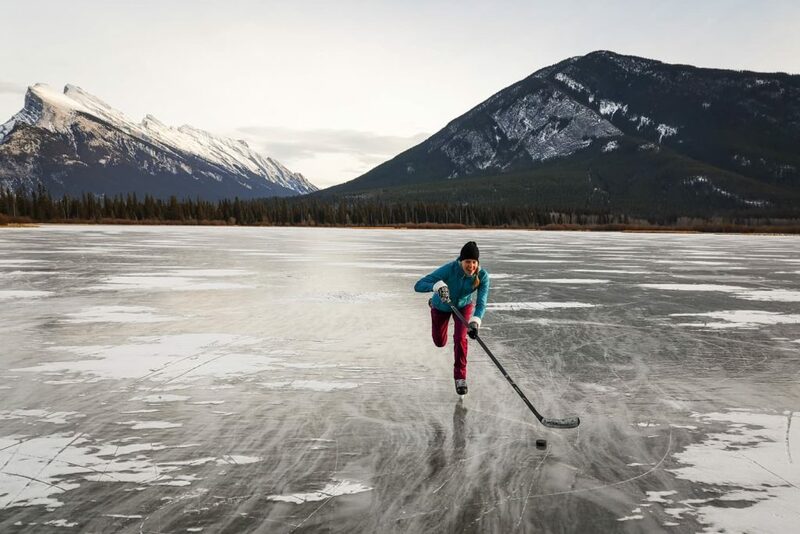 We used to play ice hockey on frozen ponds back in Slovakia and bought ice skates just a few months after we moved to Canada. It’s one of the most enjoyable activities for us, also because you can ice skate for about 4 months every winter season. Our first ice skating session was on Christmas day when we bought each other skates and went out to test them. A huge lake in downtown Calgary was frozen and cleared of snow. It didn’t matter it was -20°C and no people anywhere on the streets. It was just us and the crackling noise of our skates. We were hooked from that moment. 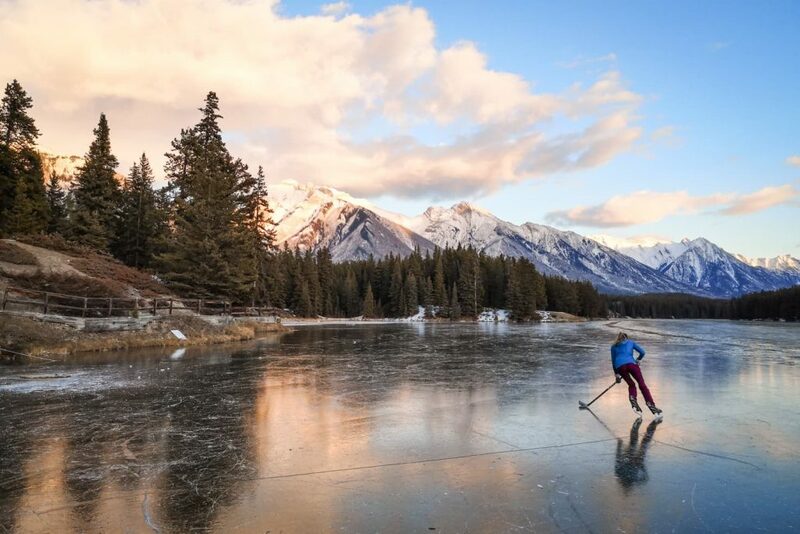 And even though playing hockey on outdoor ice rinks around Calgary is fun, skating in the mountains on lakes is even better. 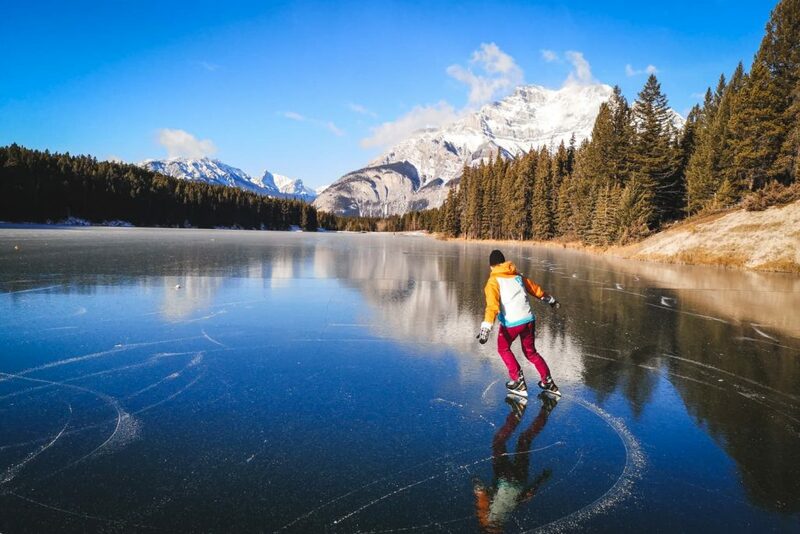 When the lake freezes and you’re able to ice skate on the crystal clear lake or a pond, let alone surrounded by mountains, the feeling of freedom and connection to nature is out of this world. It’s graciously called “Wild ice skating”. 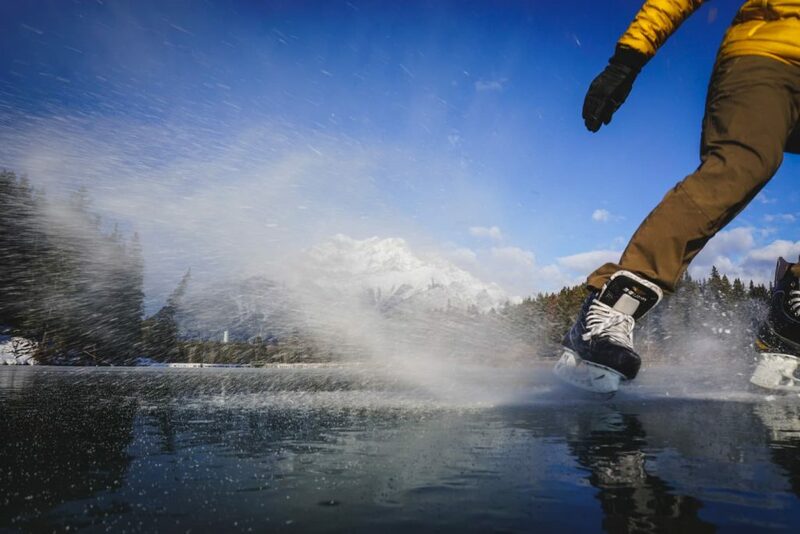 We haven’t been always lucky to skate on crystal clear frozen lakes. And trust me; you do need luck on your side. We have waited 5 years for the best ice skating weekend ever. 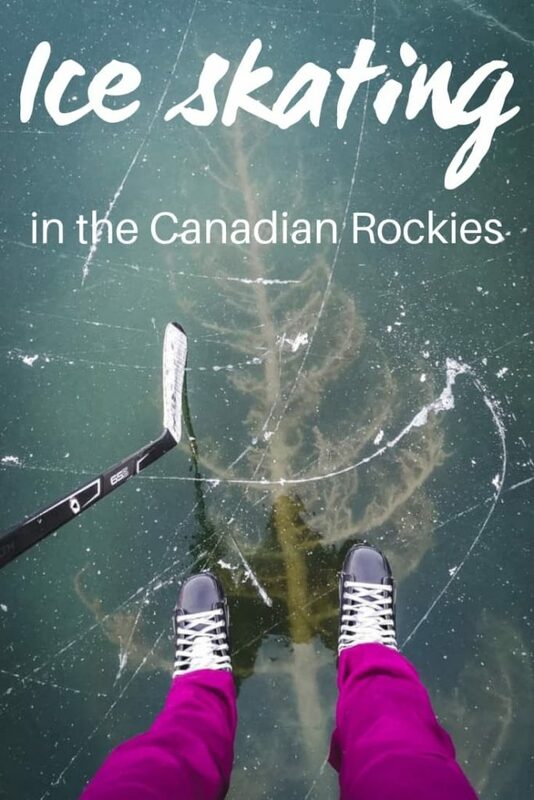 There is a short weather window between the ice on lakes being thick enough for ice skating and being covered in snow. It’s the time when you can skate on a clear ice with unreal mirror reflections. Sometimes the weather window lasts a day, sometimes a week. Luckily there are still some good souls who clear the snow from a part of the lake so you can skate but once it’s snowed, the mirror reflections are gone. 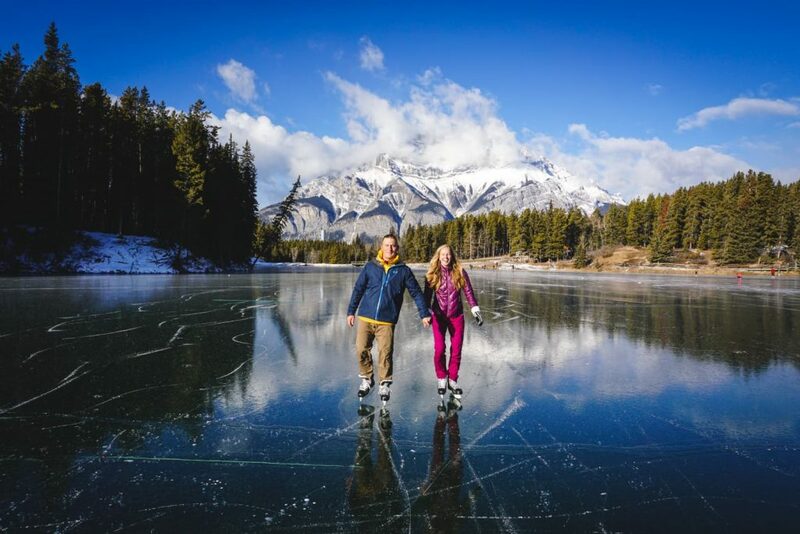 Ice skating in Banff, on clear or snow-covered lakes, is nonetheless amazing. 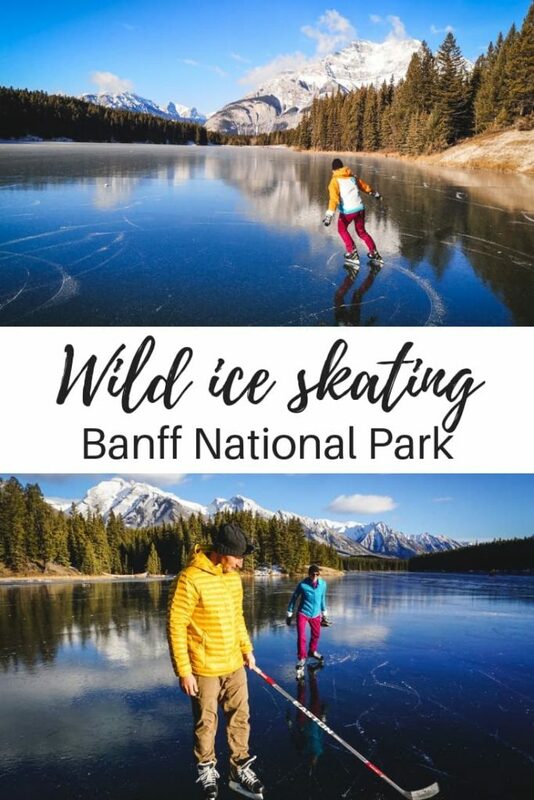 I’m going to show you where to skate in Banff National Park and approximate times when you should go. Or even better, I will show you where you should check if it’s a good idea to head out and also some safety tips. 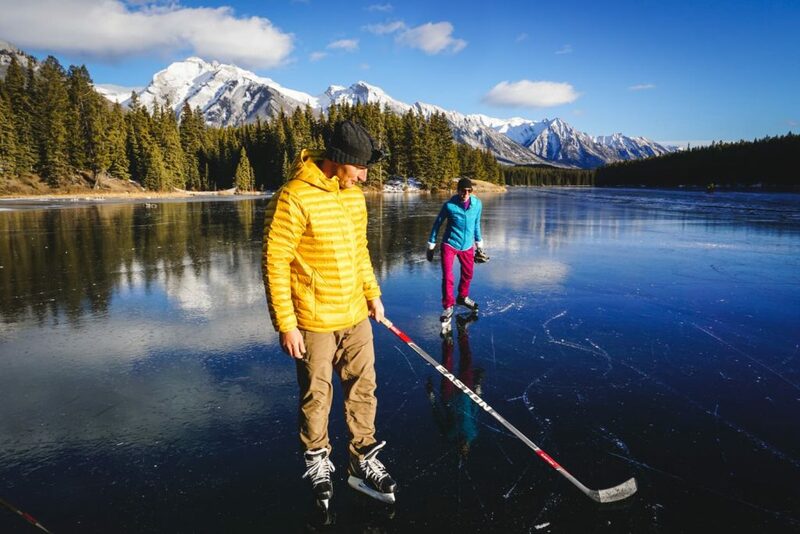 Only 10 km east of Banff, this lake is a popular one. It usually freezes in the middle of November, as in the case of 2018, it was ready for ice skating November 10th, perfect timing for a long weekend. The mirror reflections were incredible. 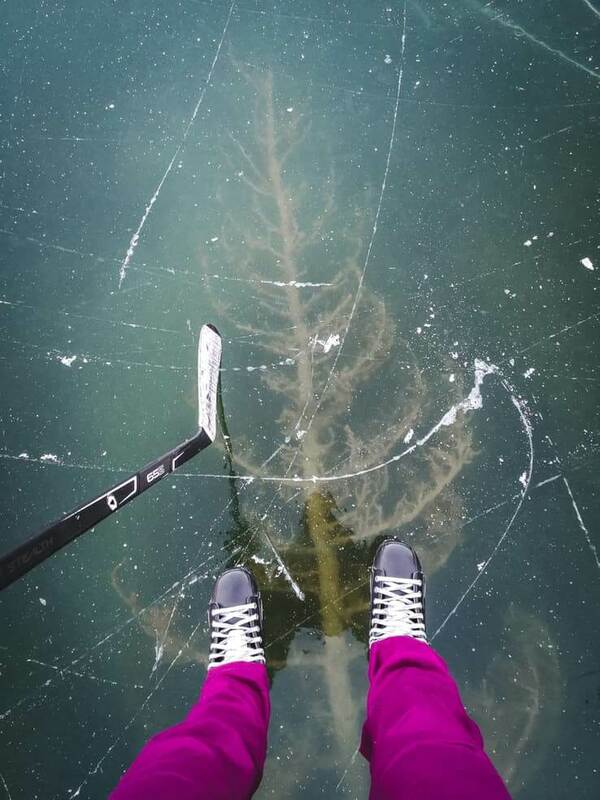 General rules say you can skate on a lake when the ice is about 10cm thick. Judging from the occasional cracks, we could see the thickness of the ice. The best ice skating is in the morning when it’s the coldest. As the sun rose, we could hear occasional cracks echoing across the lake. The ice was incredibly smooth and ideal for playing ice hockey. We even saw some people taking advantage of the rope on the tree and swinging on it. 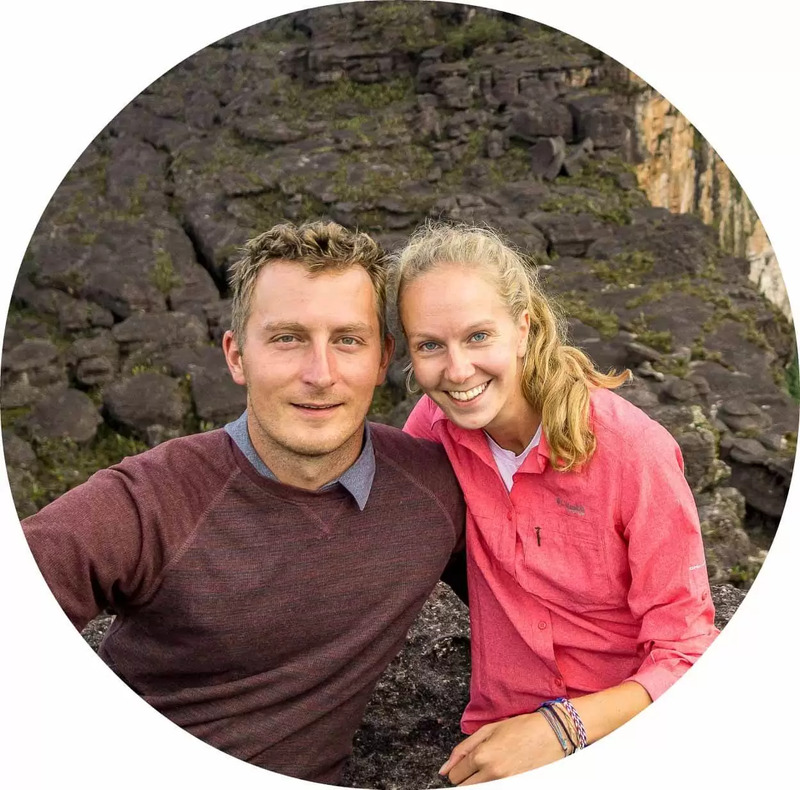 Although it may seem more of a summer activity when swinging and jumping into the lake, you can have fun in winter as well. Johnson Lake is about 1km long so even when you don’t have a hockey stick, just doing loops is a great workout. A group of 3 lakes which usually freeze in November as well. 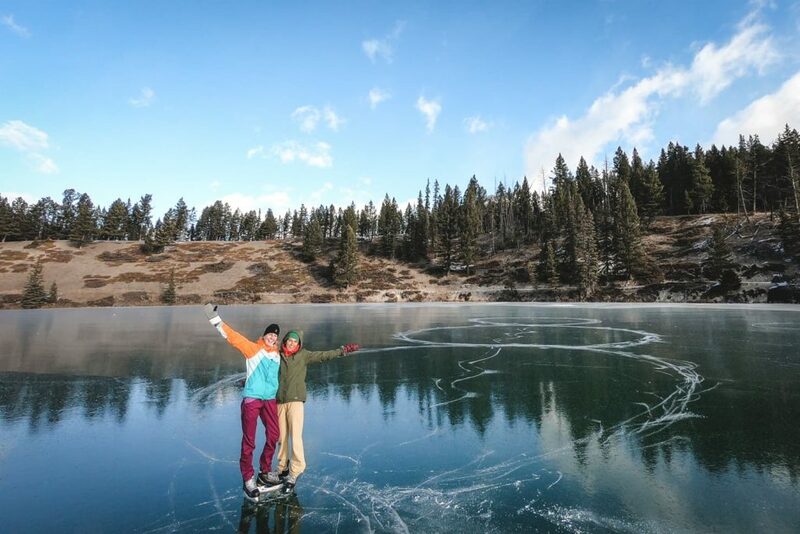 The 2nd and 3rd lakes were solid for skating when we visited in the middle of November 2018. There were occasional cracks and snow patches so not ideal for a hockey game but good enough for casual skating. The ice was quite milky and not as smooth as on Johnson Lake but if the cracking sounds make you nervous, Vermilion Lakes are ideal. Most of the surface is very shallow so even when an incident happens and the ice breaks, it’s only knee deep. 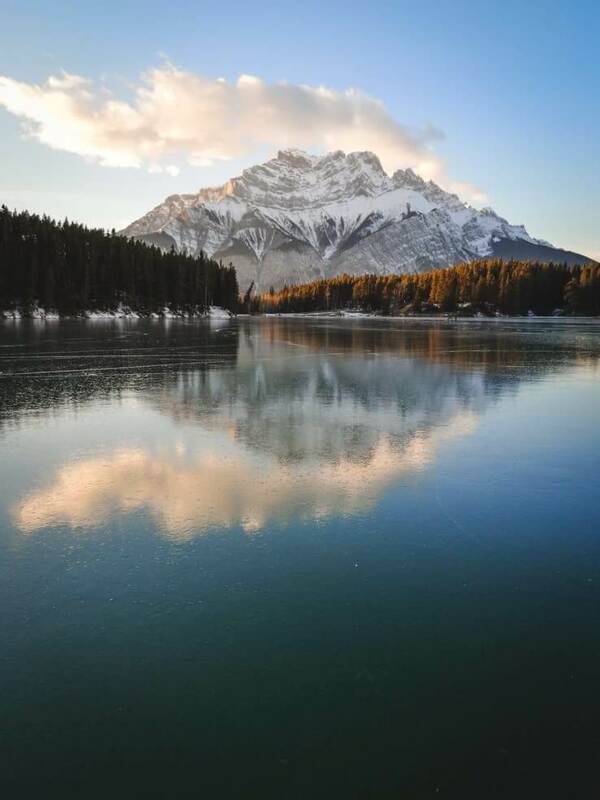 Most popular lakes in Banff National Park during the summertime are the last to freeze, usually mid-December. We haven’t had a chance to skate on them yet (fingers crossed for this winter). Because they freeze so late, they are usually almost immediately covered by snow. And you really don’t want to ice skate on a lake when you don’t see what’s underneath you. 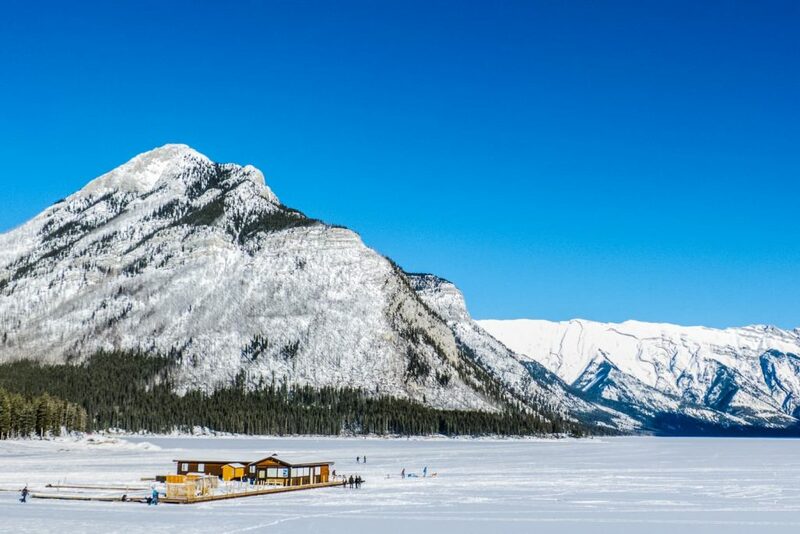 Lake Minnewanka is 28km in length so ice skating would be an awesome treat. I’ve never seen anyone ice skating on a clear ice here. But there are sections of ice cleared of snow and maintained throughout winter. One section is a loop with ice sculptures in the middle which are made during the annual Ice Magic Festival in January (next one is January 16-27th, 2019). 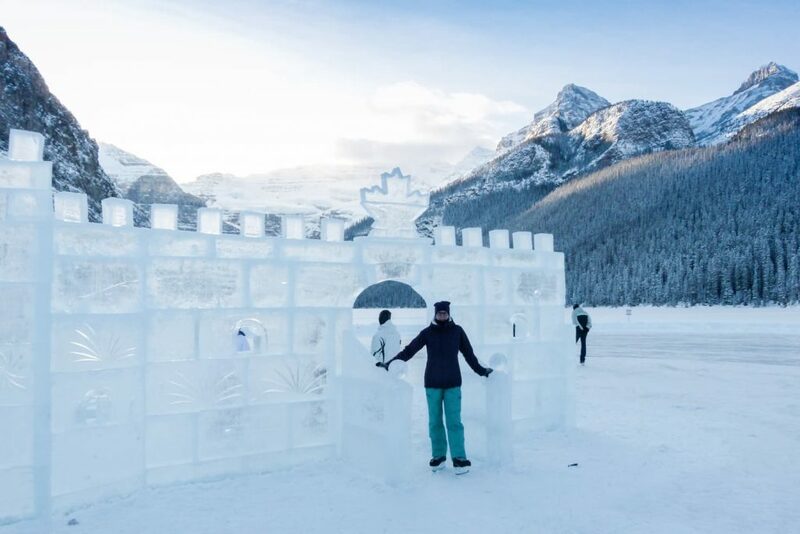 It’s literally ice skating around an ice castle in the valley surrounded by mountain peaks and Victoria Glacier in the far end. The other section cleared of snow is a hockey rink with nets. 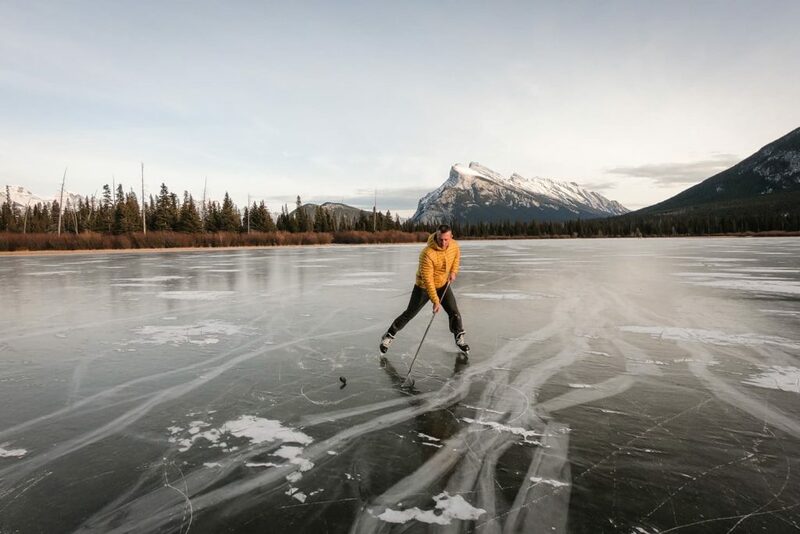 Outdoor rink near The Fairmont Banff Springs Hotel (maintained rink) – it’s located below the Waldhaus Restaurant, has a comfortable heated shelter AND a bonfire. 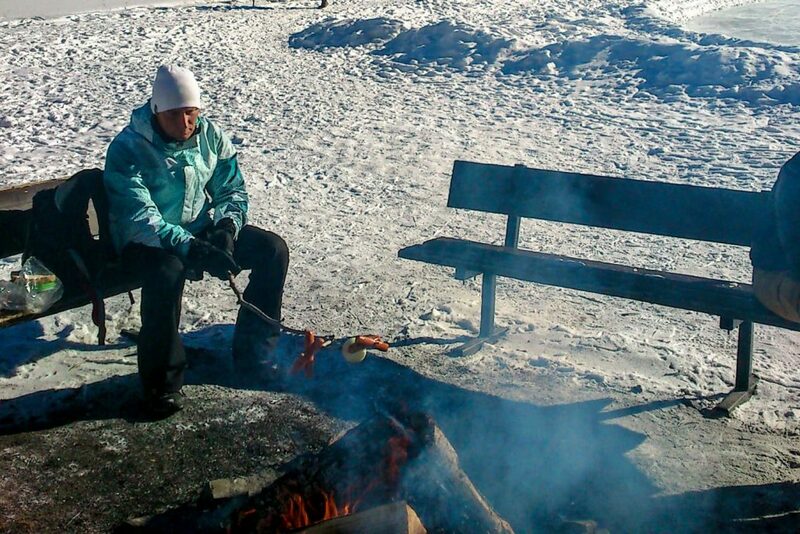 We bought some sausages before we went and made a nice lunch after the ice skating. The best spot in Banff. 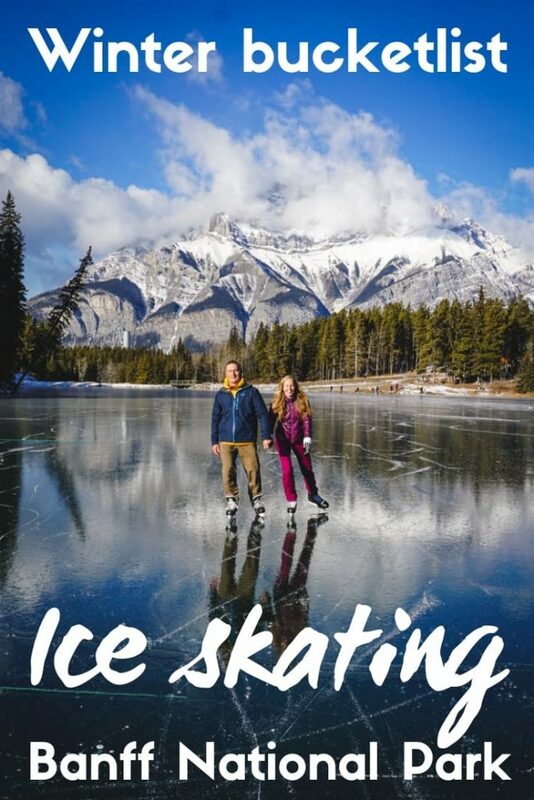 Fenlands Banff Recreation Centre (maintained rink) – the indoor & outdoor rink with on-site skate rentals is open for public and costs 6,50CAD, check their schedule here. Personal note: I like to go skating anywhere where I can see recent tracks or people skating. It gives me a piece of mind. “Building” a snowman on ice. Can you see it? 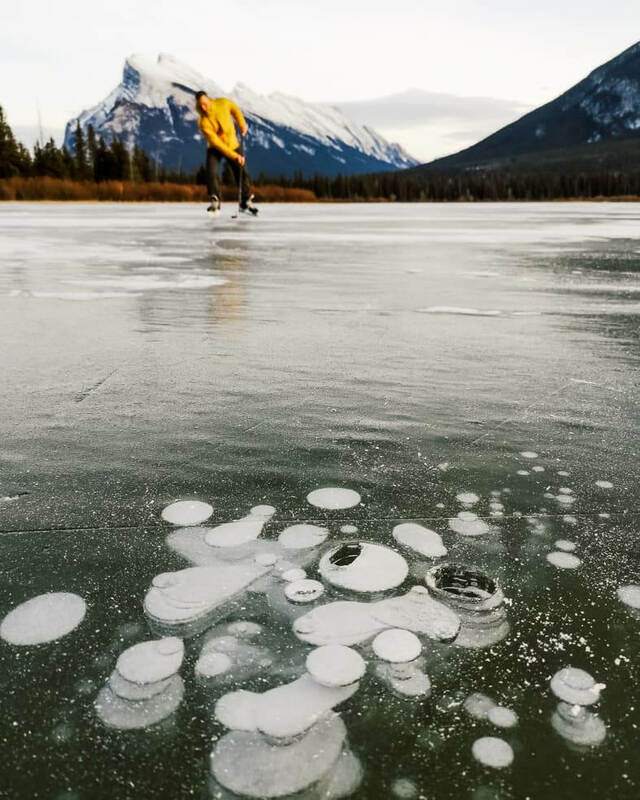 An important disclosure: Ice skating on a lake is never 100% safe. It’s up to every individual to check if the ice is safe and have proper gear for ice skating. Don’t venture out by yourself on a lake where you don’t see any tracks, try to skate in a group and follow recent tracks. 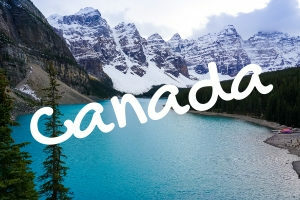 Peyto Lake, Canada – photoshopped or real? 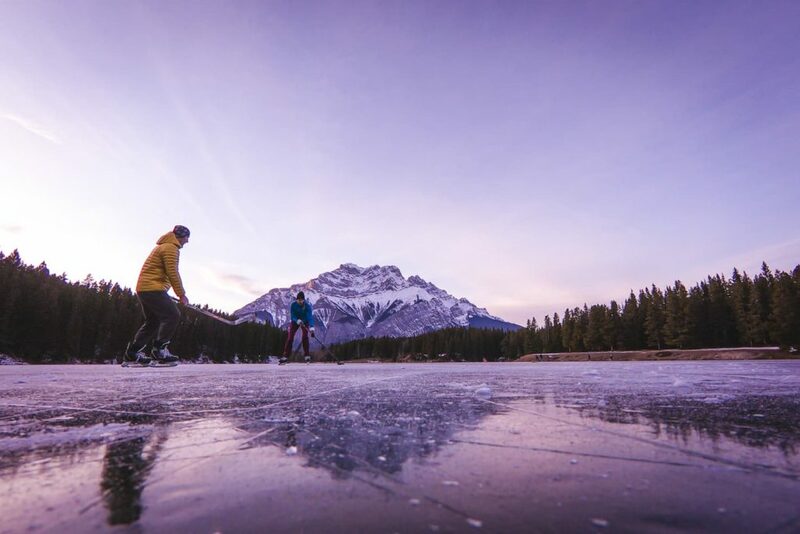 Who’s ready for ice skating in Banff National Park? Share your experience with us below.